In the words of Gary Vaynerchuk, this part is the Right Hook. This is the part most difficult for businesses and organizations. When it comes to driving traffic to your website, building a list of leads, asking for sales businesses struggle to find a balance. They either do it constantly, or they never do it. Driving traffic is about asking your network to take an action, usually called conversion. Business that do a great job of measuring the results of their marketing online keep track of many conversions, not only sales. A website visit, a request to join a mailing list, reading a blog post, watching a video, joining a webinar and more. Most of the time a business errs on the side of asking too much. A constant stream of tweets with links back to a business website or blog tells a potential follower that the business does not care about them or what they have to say. Givers gain is a common mantra in the art of building a network. If all you are doing is asking something of your followers, but not giving them anything, you might as well be talking to yourself. I know, I know, every blog post you write is full of knowledge you are giving away from free, but let's remember that the reason a person writes a blog is to make sure their website is visited often. That might be free knowledge you are giving away, but there is still a cost to the reader, you are still asking something of them. Stop looking so needy, "Come to my site, please!" On the other side,there are businesses that can't quite understand how using a tool like Facebook or Twitter, or even writing a blog, will get them a sale. Sure you may know all of your followers favourite restaurants, their favourite tv shows and sports teams, you know who they are married to and how many kids they have, and they know the same things about you. But don't forget that you are here to get people to buy from you. Now that you've built trust with your followers, you need to ask them to do something once in awhile. 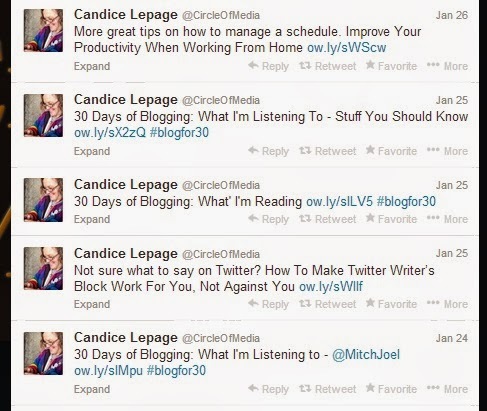 Just because your website is in your Twitter profile does not mean that your followers are going to click it. They might not have any idea what you do! Help them to understand. There are a number of different ratios I've heard around the water cooler of the internet. Some people love the Pareto principle and apply it to everything, so 80% of your posts should be about building your community and 20% about converting traffic or selling to them. I've heard of the lis-TEN ratio, 1 sales tweet to 10 replies. Gary Vaynerchuk argued to have his book called "Jab, Jab, Jab, Jab, Jab, Right Hook" since he feels it should be 5 jabs, or conversational posts, to one right hook. 5. Talk about your business, share a link or ask for a sale. Everyone has a different formula, but what you will notice is that the majority of what you do should not be asking for a sale, but you do need to ask for something. We are all busy people, help me out and make it easier for me to do business with you by letting me know what you can do. I think, your website is very visited, by me, at least. I wanna share these custom writing services and make sure that you will find many interesting details there.